The word “millennial” has evolved into a pejorative within the real estate industry. With a cringe factor reaching the same level as terms like “glamour shot” and “sub-prime,” you would be hard-pressed to discuss it with an agent and not see them scramble for a bottle of hand sanitizer. Thankfully, attitudes on millennials are adjusting. Slowly, the number of eye rolls the subject generates within the industry are becoming reactions to the misconception of their intent to own than stereotypes about poor work ethic and entitlement issues. Millennials’ supposed resistance to settling down is rooted in easily challenged data and innuendo. The National Association of REALTORS® reports that the median age for a first-time homebuyer in 2015 was 31 years old. In the early 1970s, that number was 30.6 years old. That’s 40 years of almost no change in the age at which people start their home-buying life cycle. The oldest millennials are now in their low 30s, meaning that a significant portion of the group remains well below the age of entry to the home-buying market. Studies have also shown that the lack of homeownership among them is driven by finances, not cultural trends. An August 2016 study by Fannie Mae shows that the lack of today’s financial means to own among millennials is largely a lingering impact of the Great Recession, when the number of homes owned by those between the ages of 25-34 was 10 percent higher than it is today. And guess where that 10 percent has been living since? Today’s 18-34 year olds are living at home more often than their 1940s-era peers, a fact that is no doubt leading to so many agents believing the millennial myth. Yet, the number of people under 25 owning a home is 9 percent higher than it was in 1973. It can be safely summarized that the panic from some in the industry is largely due to a general lack of patience and the need to fill coffers left bare by those who have neglected buying in lieu of refinancing. 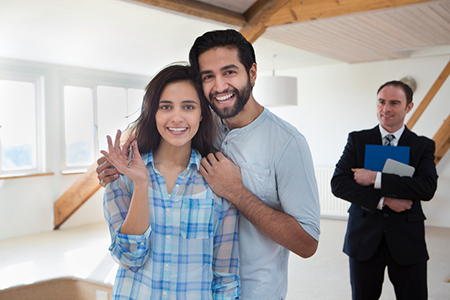 If two-thirds of the millennial demographic remain below the average age of first-time buyers, it stands to reason that real estate agents who want their business should get started today trying to reach them. Marketing to millennials isn’t fundamentally different than it is with any other group of potential buyers. It’s all about message consistency. Remember that it’s going to be a few years before millennials are impacting the market. Your timeframes call for subtle but ever-present messaging. Real estate agents should avoid overly-direct, time-focused marketing messages when chasing the millennial buyer. Don’t push messages that claim “now is the time” or that “sellers are starting to act”—adjust to the soft sale. Agents should strongly consider differentiating their message for existing clients, short-term prospective clients, and long-term prospective clients (i.e., millennials). Consider using online advertising, retargeting tactics, and social media brand-building for your longer-term strategies; and give these efforts time to work. Instead of announcing every new listing or closing on your social channels, build your image around the things you do and the places you go. You can’t sell to millennials; you have to relate to them. Choose online advertising partners that allow you to target zip codes, especially those in up-and-coming urban centers where millennial lifestyles dominate. Use email marketing and direct mail to stay in front of older, more established buyers and sellers. The phone is exceptionally effective in this regard. The real estate industry’s obsession with all people aged 34 and under should be channeled into a collective, proactive effort to communicate the benefits of homeownership. Sure, most millennials already plan on buying, but why not use this window of inactivity as productively as possible? Advertise. Advocate. Communicate. Lest we forget, this is the demographic driving innovation throughout Silicon Valley, taking risks on new companies, earning the trust of investors, and commercializing technology that the business world uses every day. It’s safe to assume they’ll be buying houses.